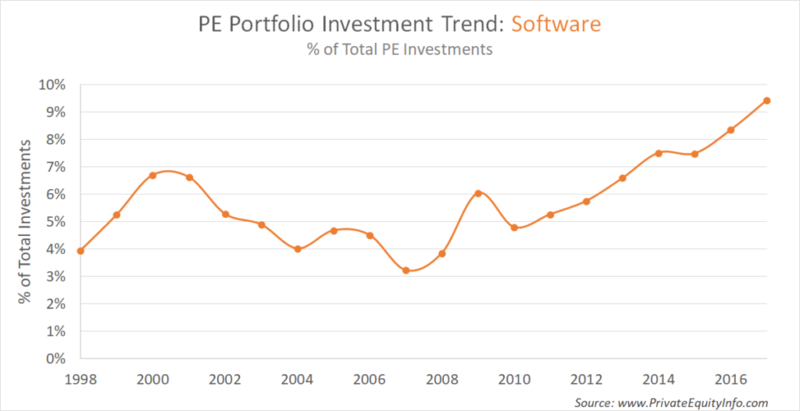 Private equity firms are collectively focusing a larger percentage of the industry’s investment pool into software companies, which now represent ~9.5% of all private equity deals in 2017 YTD. Our data shows investments in healthcare companies, as a share of the overall private equity investment pool, has increased significantly, representing ~7% of all private equity deals in 2017 YTD. I ran some analytics on our private equity portfolio company data to view changes in how PE firms invest in various industries over time. 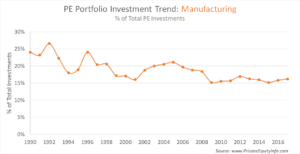 The graph below shows the historical investment trend for manufacturing portfolio companies by year. Investments in manufacturing companies, as a share of the overall private equity investment pool, has decreased, but seems to have settled around 15 – 17%. The histogram below shows the distribution of holding periods for portfolio company exits in 2017 YTD. While the data looks much like a normal distribution for holdings periods 0 – 8 years, there’s an unusual bump up in years 8 – 10. Read my previous explanation about this effect related to the recession of 2008 – 2010. Also, a large portion of the longest held investments (12+ years), were European private equity firms holding European portfolio companies. Cultural difference. 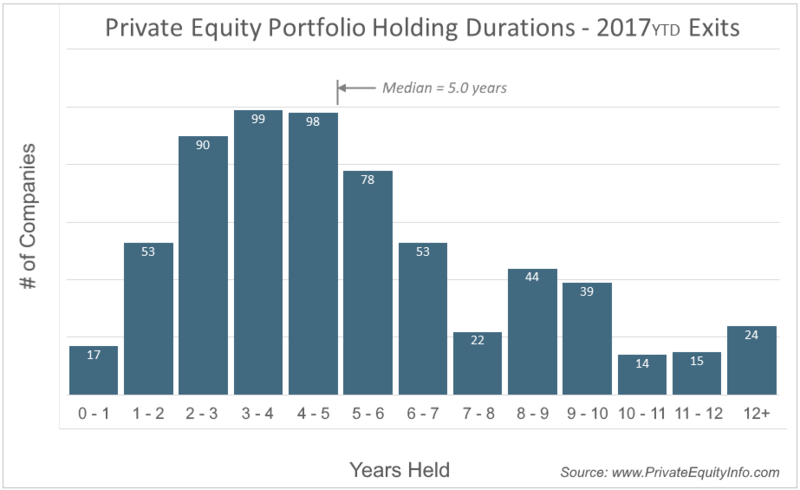 The most recent data from www.PrivateEquityInfo.com shows median portfolio holding periods continue their slight downward trend as private equity firms capitalize on higher valuations. We reviewed private equity portfolio acquisitions over the last 12 months (September 2016 – August 2017) to determine which firms were most acquisitive and then grouped them by typical deal size. The list below highlights some of the most active firms in each deal size range (Mega, Large, Mid, Small). 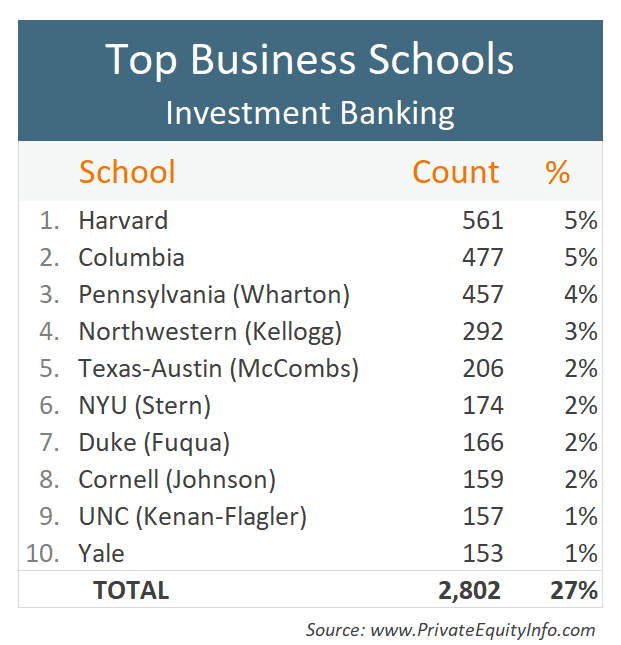 The top 10 business schools for investment banking careers produce 27% of middle market investment bankers in the U.S. (data excludes bulge bracket firms). While considerable, this is not nearly as academically homogeneous as the feeder schools for private equity professionals. The top 8 business schools produced half of the senior-level professionals in private equity. 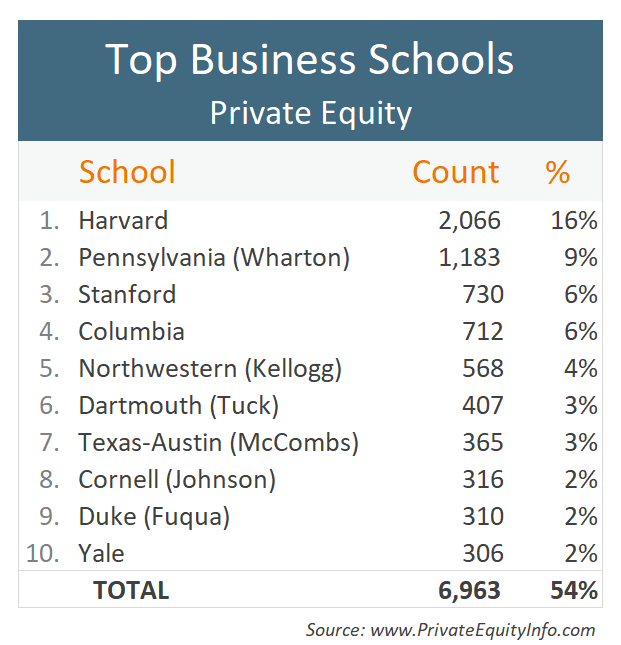 Even more impressive, 25% of private equity executives are alumni of the top 2 schools – Harvard and Wharton. 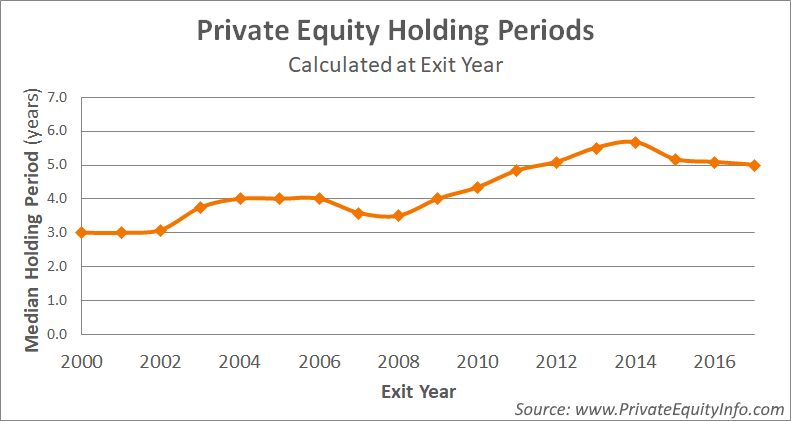 In studying our historical data of private equity portfolio company investments & exits, I found that the private equity community, as a group, tends to miss macro-economic trends, often buying at the peak and divesting at the bottom of market cycles. But select private equity firms got the timing quite right and some contrarian firms got it really right. 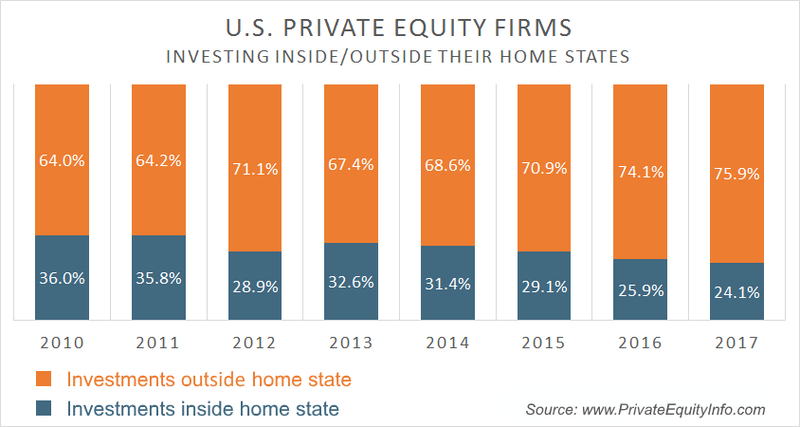 U.S. private equity firms, on average, acquire approximately 75% of their portfolio companies outside their home state (up from 64% in 2010). 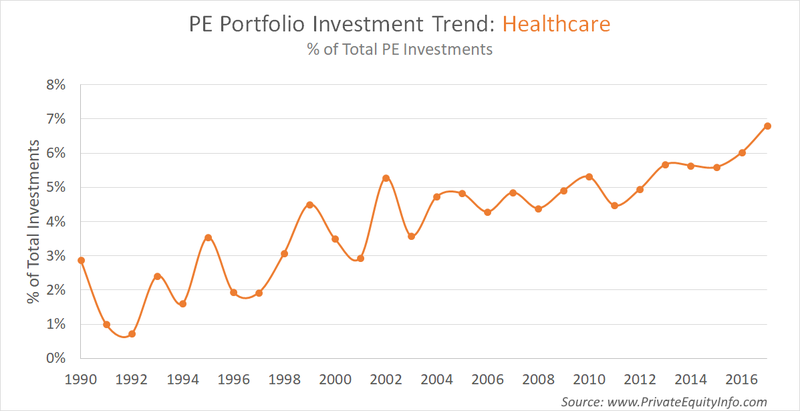 Reviewing historical data from our Research Database, there appears to be a gradual trend of PE firms increasingly investing further from home. I would speculate this correlates to an increase in fund sizes, permitting the financial buyers to acquire larger portfolio companies, thus justifying a larger geographic reach.